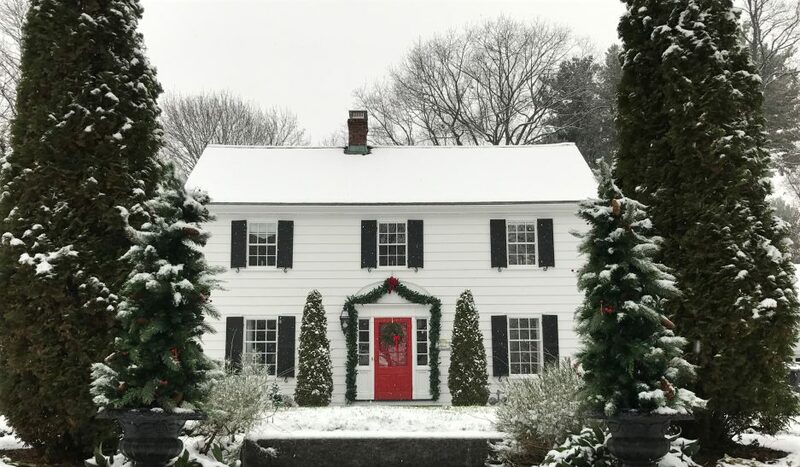 A preschool teacher once declared about my now 15yr old son, “you better have a plan, because if you don’t, he does!” The same sentiment holds true for my entire household. With two active teenage boys, and one “sign me up for everything” tween, things can quickly get derailed. In my attempts to contain the chaos as much possible, I have a general plan or template for dinners each week. This is so helpful when grocery shopping; daily trips to the store are only occasional, and money is saved because I’m shopping more efficiently with menus in mind. I’ve learned the hard way, that if I don’t have a solid dinner plan in place by the time the kids get home from school, we’re probably doing take out! Taco Tuesday– Build your own tacos, fajitas, burritos, etc. I usually set out a protein, with loads of grilled/sautéed veggies, rice, beans, tortillas, cheese, guacamole, and salsa. Friday– Take-out, and by the end of the week I’m ready for it. Meatless Monday usually means fish, like Fast and Crunchy Baked Cod or fillets simply seasoned with salt and pepper and briefly roasted in the oven. 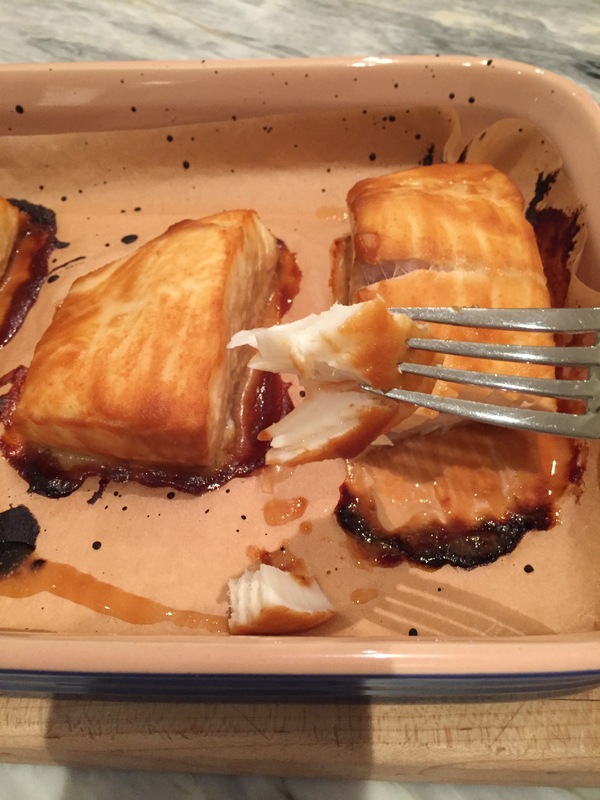 Recently, Miso Glazed Fish has made several successful appearances. The glaze is slightly sweet/salty and perfect for firm fish like swordfish, halibut, and salmon. Sea bass and sable (black cod) would be wonderful as well, but they are expensive compared to the others. The dish is quick and easy. Popped into the oven, it is done in no time. Serve with rice and something green. 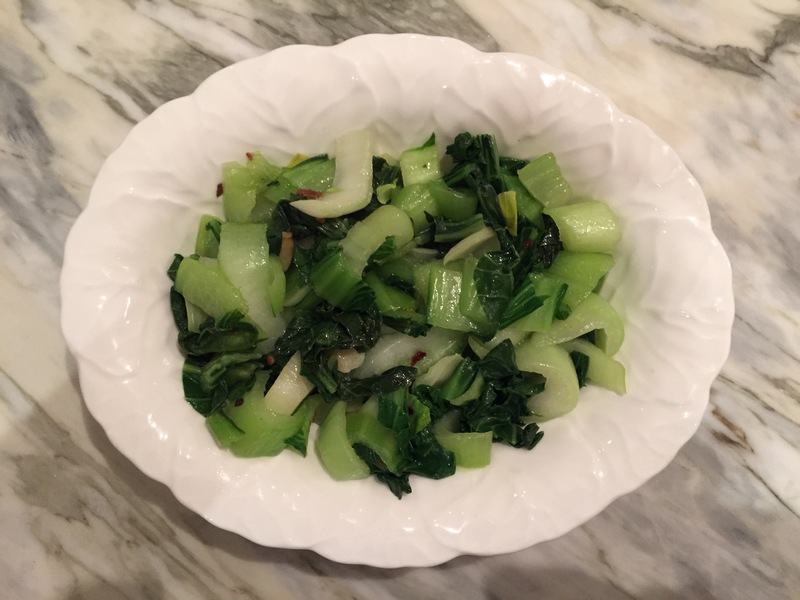 We love it with bok choy sautéed with ginger, garlic, and a pinch of red pepper flakes (recipe follows miso glazed fish). Note about the photos- You’ll see that there is no beautifully plated finished product. This is the result of the aforementioned active teens and tween. As soon as the fish came out of the oven, I was able to quickly snap a few pics before it was gobbled up. Then it was off to drop one son at basketball, pick the other up from his basketball practice, and get my daughter to ballet. In my ideal world, the final shot would have been a gorgeous piece of fish, lightly sprinkled with sliced green onions, presented on a bed of rice, with bright green bok choy on the side. Use your imagination! You can see it, right? 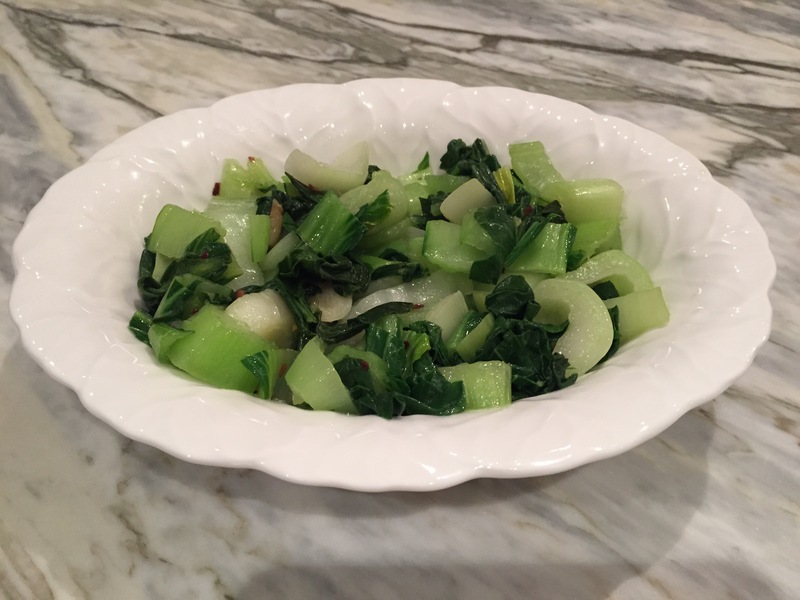 On the bright side, the bok choy did make it into a serving bowl! How about you? Do you have a general idea of what your dinners will look like throughout the week? Or, do you decide day by day? Preheat oven to 375°F. In a small saucepan over medium heat, place vermouth, rice vinegar, white miso, sugar, and black vinegar. As the glaze warms, stir to dissolve sugar. Remove from heat and let cool. In a parchment lined casserole or sheet pan place fish or fish fillets. With a pastry brush, off-set spatula, or spoon, glaze top and sides of fish. I always have glaze left over, so don’t feel the need to use it all. Place fish in oven. Cook times will vary depending on thickness of the fish. I usually start checking at the 15 minute mark. The fish is done when it is opaque in the center and easily flakes with a fork. Alternatively, you can place the fish under the broiler for approximately 6 minutes… but keep an eye on it, it can quickly burn. *If you have sake, please feel free to use in place of vermouth. But we don’t have sake, and I probably won’t buy an entire bottle just to have on hand for this dish. Vermouth works well, as would dry sherry. Put vermouth, rice vinegar, white miso, sugar, and black vinegar in a small saucepan. Place the saucepan over medium heat, and whisk the ingredients together until sugar dissolves. Miso glaze is done. Remove from heat and allow to cool briefly. The fillets are ready for the miso glaze. Using a pastry brush, off-set spatula, or spoon, glaze the top and sides of the fish. Place miso glazed fish into a 375°F oven. 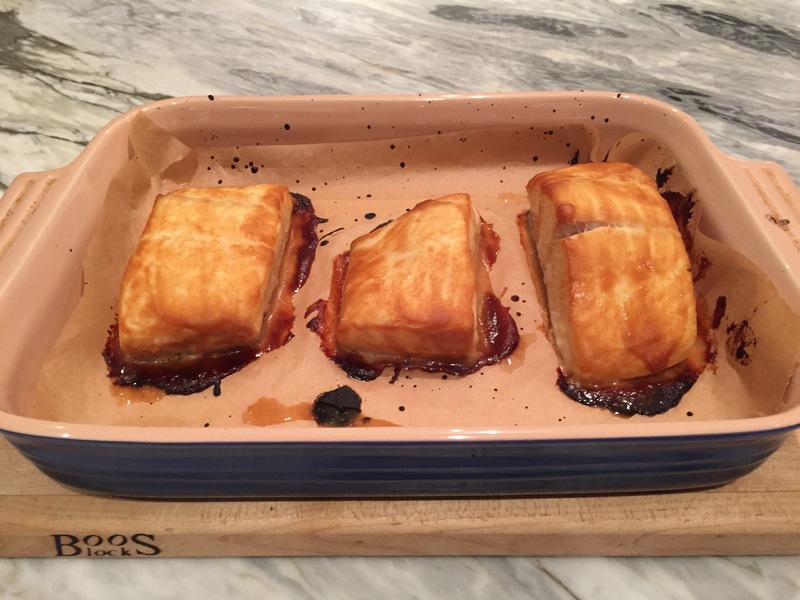 Bake for approximately 15-20 minutes, or until fish is opaque inside and can be easily flaked. Alternatively, place under a broiler for about 6 minutes, but remember to keep an eye on it! The glaze and fish can quickly burn. Out of the oven… the fish looks done, but need to be sure. Checking for doneness… the fish is opaque and easily flakes with a fork. In a large skillet, heat vegetable oil over medium high heat. Add ginger, garlic, and red pepper flakes, stirring frequently for approximately 1 minute. The ginger, garlic, and red pepper flakes are there to flavor the oil. 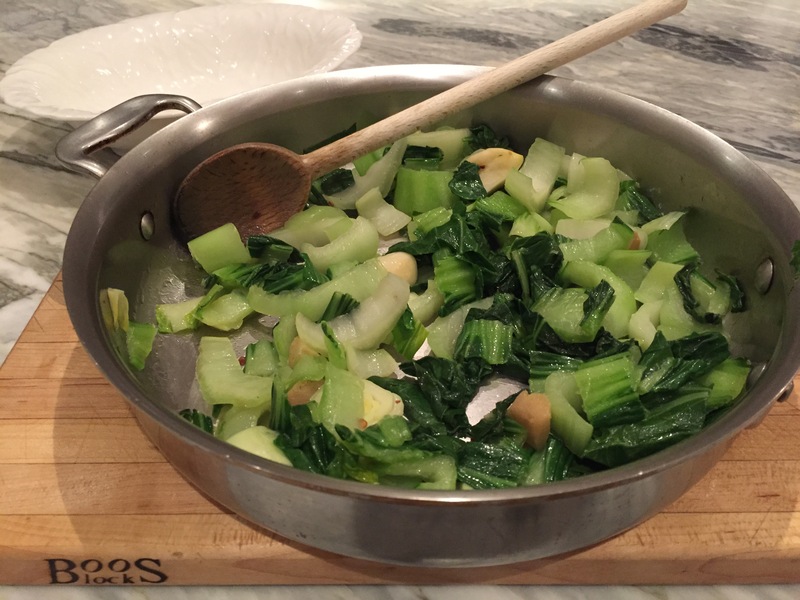 Add chopped bok choy to skillet, stirring so that it mingles with the oil. Reduce heat to medium low and cover. 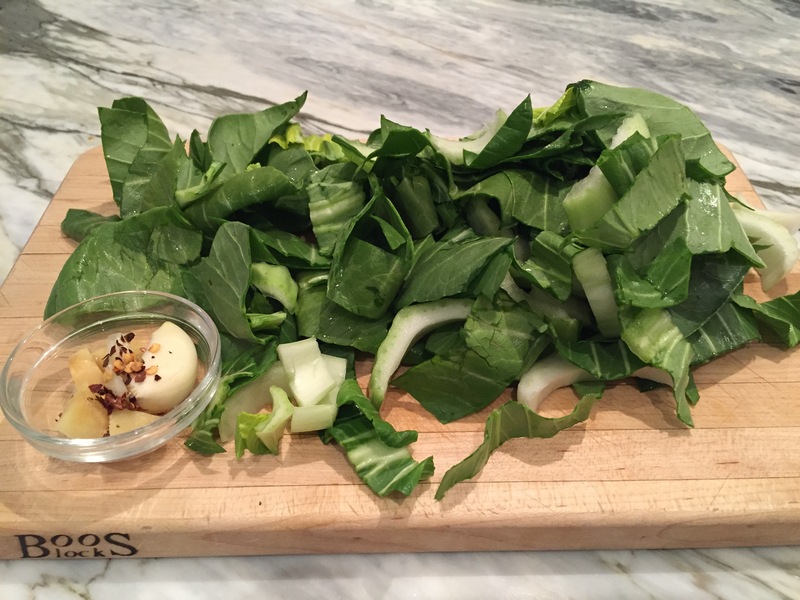 The water from rinsing the bok choy will help steam it. Cook for 3-5 minutes, checking and stirring occasionally. The bok choy will reduce down by quite a bit. The leaves will wilt and stems will be tender but retain some crunch. We happen to like the contrast of textures, but if you’d prefer more uniformity, give the stems a head start by adding them to the skillet first. 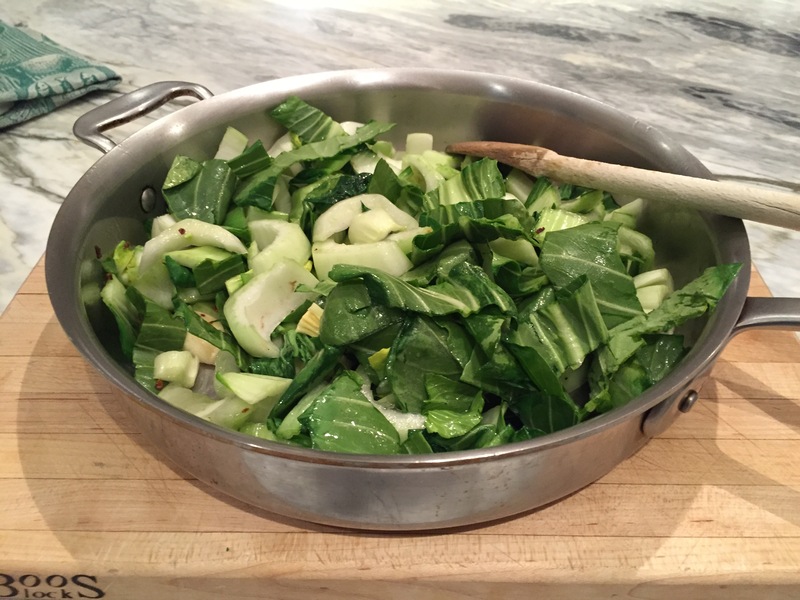 A minute or so later, add the leafy part of the bok choy. 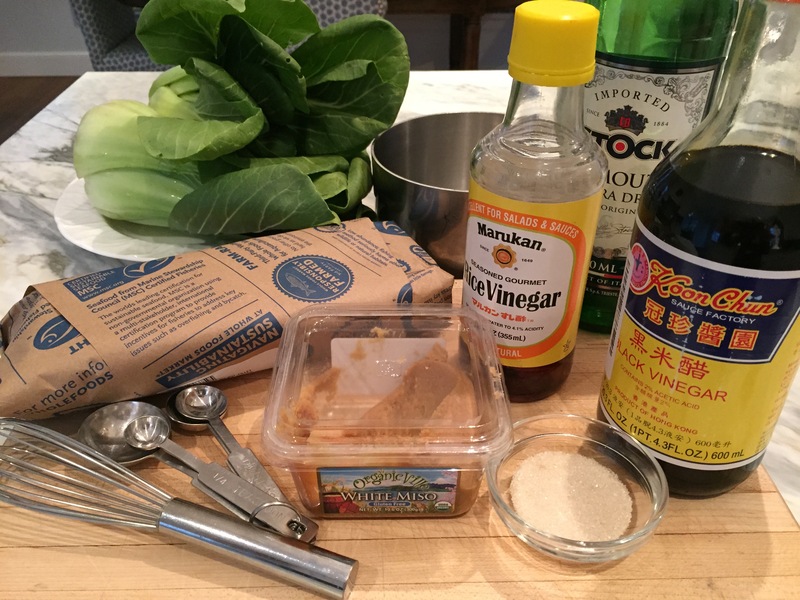 Rinse and chop the bok choy. Peel and cut a 1-inch piece of ginger in half. 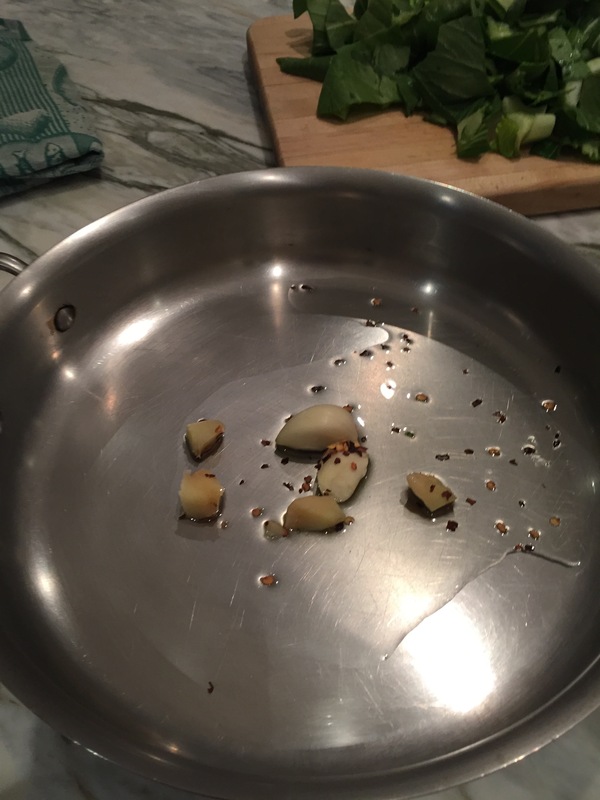 Peel a garlic clove and smash with the flat side of a knife. If you want a little bit of spice, you’ll also need a pinch of red pepper flakes. In a large skillet over medium high heat, warm a tablespoon of vegetable oil with ginger, garlic, and red pepper flakes for a minute or so. Watch carefully, so the garlic doesn’t burn. 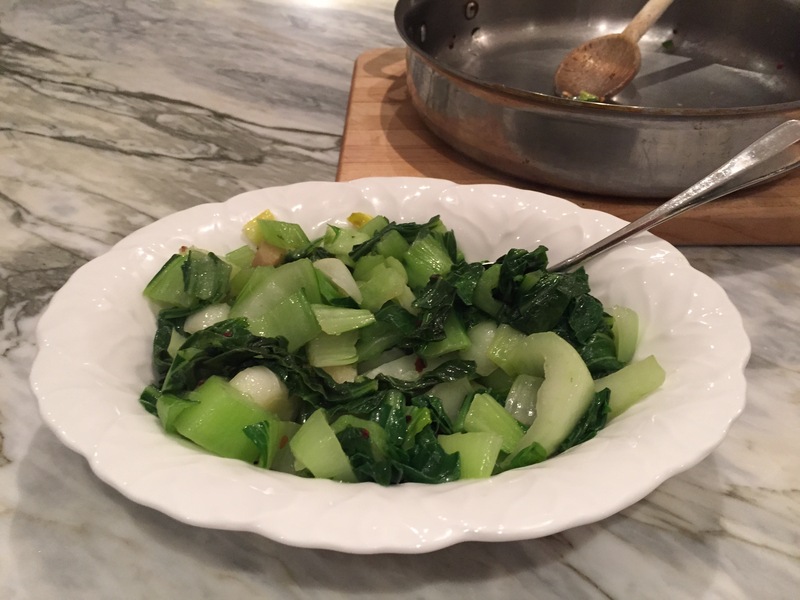 Stir in the bok choy so that all the pieces have had a chance to meet the garlic, ginger, and red pepper flakes. Reduce heat to medium low and cover. Cook for 3-5 minutes until leaves have wilted and stems are slightly tender, but retain a bit of crunch. I really like this idea! I have a menu plan as well but things are really up and down, track meets, people get sick etc. So, now with part time work and work that is not scheduled I am trying to figure this out! I think your idea of pasta night, taco night is a great idea! I am going to implement this plan! Also lovely dish! yes! well now this substitute job means looking online and deciding to take a job that day. I just saw one which started in an hour but thought no way! So I would like to make some freezer meals and have a plan in place so I can take a job like that on the spot. So I like the meal day like pasta etc. great idea! thanks! Completely agree! It’s a really good thing I love being in the kitchen. Being a part of this wonderful world of bloggers is giving me culinary inspiration from around the world! It’s amazing! Yes it is a lot of fun! Thats a beautiful meal. Perfectly healthy, this is the way I need to start eating. Yum! I just try to have various food groups available and then we mix and match. That’s a great idea… so much flexibility and spontaneity when you have everything on hand to mix and match! It’s such a busy life being the mother of teenage children in particular. There are always so many clubs and societies at school, and elsewhere, they want to attend. Playing taxi service is all part of the daily routine. We always had a menu plan when all our children were at home but now we’re not as strict. We have a general idea of the type of things we’ll be cooking each day, so shopping is all done in bulk. But, like you, we do vary things a lot. I love the miso glaze, and although we’ve never had bok soy, I intend to have a look when I’m next at the market. Lovle recipes. That sounds like great fun! I hate to say it, but, ‘Ive been there…done that…’ as they say. It’s very wearing to say the least. I’ve had similar problems with the children being at different schools, too. Looks amazing! 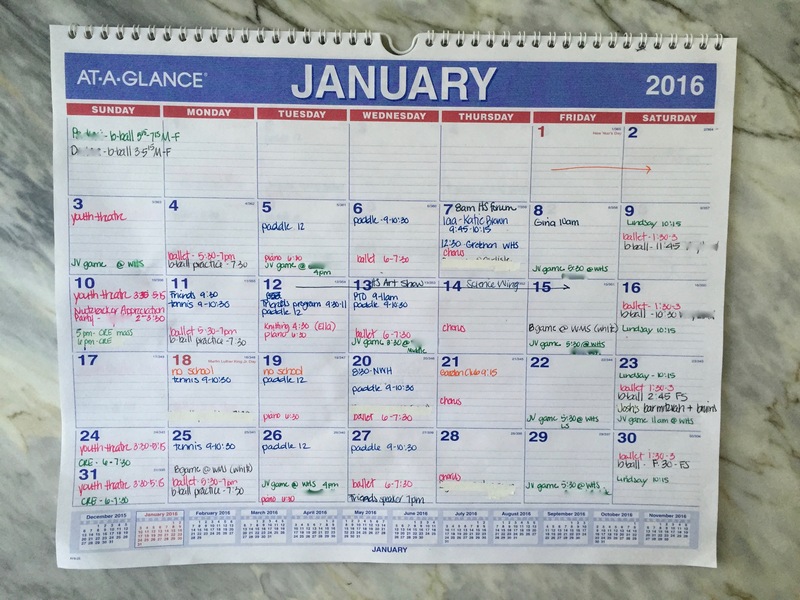 I plan a couple of days in advance, but I’m not orgnaized enough to plan a week in advance!